We offer a wonderful selection of annuals. Not only do we grow the old favorites like alyssum, coleus, impatiens, petunias, salvia and zinnias in a wide variety of colors in 4 packs. At Hilltop Greenhouse and Farm we grow and sell many unique plants. Annuals only grow for one season, but give outstanding color and performance in every location. Let us help choose the best annuals for your garden, pot, or mixed container. Our business has been based on fruits and vegetables. 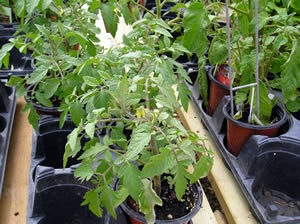 Growing varieties that will work well in your garden has been a priority for Hilltop Greenhouse and Farm. Each year we bring the knowledge we have learned in our fields to the garden center. This ensure our customers are offered fruit and vegetable plants that grow well in our area. 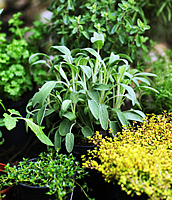 We grow a wide variety of herbs, some of the most popular and also some of the hard to find. Not only do herbs work well in a sunny spot in the vegetable garden, there is an increasing amount grown in pots on the patio. This is great when you need a little fresh herb in your barbeque. We love to use herbs in mixed containers as herb gardens or mix them with annuals and perennials to create a one of a kind, useful planter. 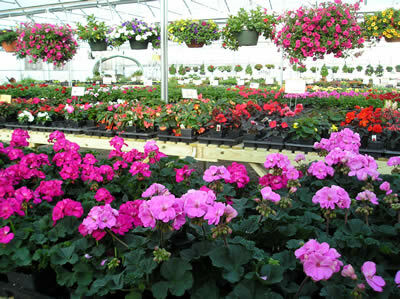 You will find a large assortment of Perennials at Hilltop Greenhouse and Farm. Perennials are listed in the separate hardiness zones and have a specific bloom period. We carry old favorites like delphinium to the new Echinacea and heucheras. Our knowledgeable staff will assist you in finding the right perennial for the right spot: sun, shade, dry or wet area. We also make sure the perennials you purchase at our Garden Center are zoned for our winter weather. Let us help plan that perennial garden that will bloom all season. Have you tried mixing perennials into your mixed patio containers? They add unique interest, texture and hardiness to any planter. 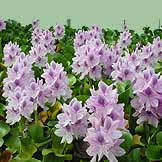 Choose from Water Lilies, Parrots Feather, Zebra Rush, Water Hyacinth or Water Lettuce! Creating a water garden can be as easy as a container on the patio with a Water Hyacinth or as complex as an in ground pond with a waterfall. 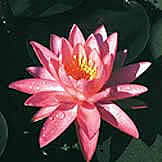 We sell floating water plants to spread and cover space on the surface of your garden, hardy Water Lilies that sit at the bottom of the water garden sending leaves and beautiful flowers to the surface. To round off the mix we also carry hardy and tropical marginal plants. Stop by Hilltop Greenhouse and Farm to find that perfect water plant. 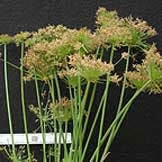 We have a variety of new introductions both flowering and with interesting foliage. If you do not see what you are looking for, let us know and we will try and find that perfect plant to plant in your landscape. Trees and shrubs, like perennials have hardiness zones, and we will be sure you have on that will grace your year with beauty for years to come.